After I dropped Roma off to the train station in Tralee, I set out for Kenmare to resume the 100 Corners of Ireland tour where I had left off last Saturday evening. In the meantime I had done the Dingle Peninsula yesterday with Roma, so I had just the small matter of the Ring of Kerry to do before heading to North Kerry and on to Clare. 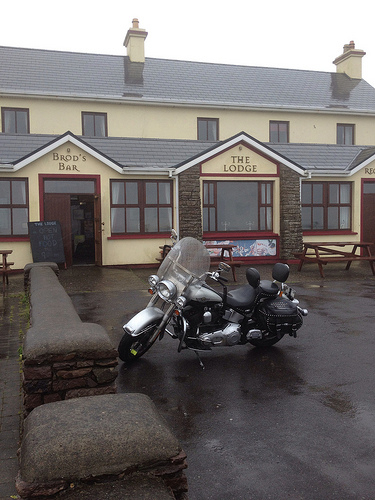 I had hoped to at least get to North Kerry today, but the rain soon put a stop to that. 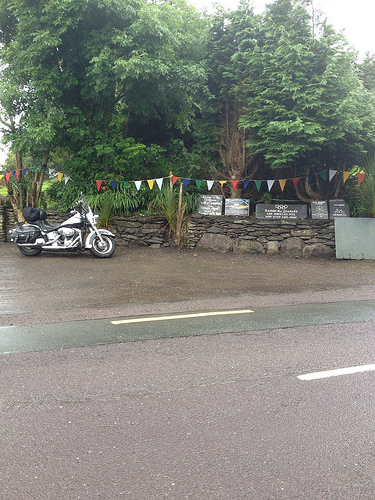 While I set out in warm sunshine, by Kenmare the rain had started and there was also a thick mist, which got thicker. By Sneem, I was wondering was it possible that this could last all day long? I wasn't making much progress on the road and I could see very little on either side of the road. Occasionally I would get a glimpse of the sea on my left, but the conditions meant I had to concentrate hard on the road. Despite starting to feel wet all over, water was getting in to my clothes from everywhere, I was aware that it was just as wet for everybody else. I sympathised with the hikers and cyclists who were not letting the rain get the better of them. In Sneem, there were a lot of tourists wakling around in shorts and wind-cheaters - perhaps they were optimistic that the weather would get better? So we were all in it together. I was the only guest in this hotel. The only stop I made today was in Castlecove where I spotted a "Wall of Champions" to local sporting heroes that the village is very proud of. By now I was prepared to abandon the 100 Corners for the day and I stopped in The Lodge Hotel in Waterville and got a room for 29 euro (including breakfast!). They are also drying out my boots and jeans. I bought a new pair of Wellingtons and hope that I won't be thrown out of the Biker's Union if seen with them on - but at least my feet should be dry from now on! As I write this I am in the Lobster Bar in Waterville, where there are noisy kids running riot. I had a delicious afternoon tea and scones for 3.50e, and am finishing off with a small Jameson. I am dry. I am warm. I am fed. I am happy.